SEOUL -- Despite public skepticism over safety and usefulness, South Korea's first hydrogen cell-powered electric city bus will be pressed into temporary service in Seoul next month to test its commercial feasibility. 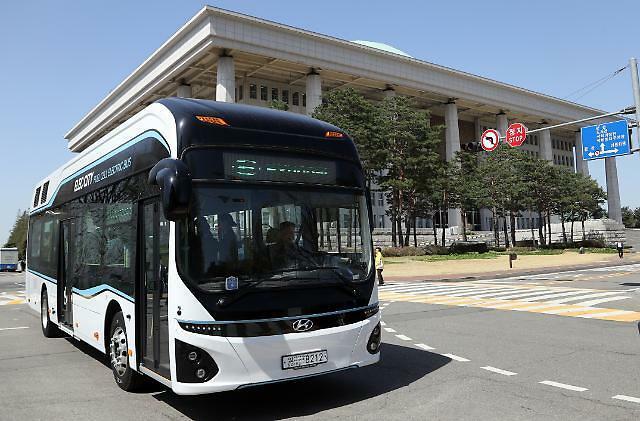 On a route from Yangje, a southern business district, into the center of Seoul, city officials will test a hydrogen fuel cell-powered electric bus in August. The hydrogen bus, donated by Hyundai Motor, uses fuel cells to power its electric motor. 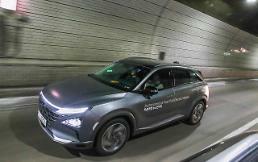 It is one of Hyundai's five hydrogen fuel cell-powered electric vehicles (FCEVs) tested in the eastern ski resort of Pyeongchang during this year's Winter Olympics. Because it generates electricity using oxygen and compressed hydrogen, the eco-friendly vehicle is ideal for urban buses as it emits just water vapor and collects particulate matter, a microscopic air pollution matter floating in the air. "We will see if there are any technical problems in operating hydrogen buses," Noh Byeong-choon, the manager of Seoul's public transport division team, told Aju News on Monday. The test run will take 12 months, he said, admitting the city government is still not sure if the hydrogen bus is fit for actual commercial operation. The biggest challenge in operating hydrogen buses for public transport in Seoul is how to set up a network of charging stations due to legal and safety problems, Noh said, adding there should be no commercial buildings within a 50-meter radius of a hydrogen fuel charging station. 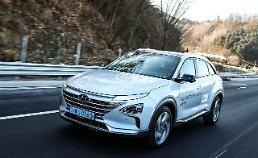 Hyundai runs one hydrogen fuel charging station in Yangje. "In order to fully adopt hydrogen buses in Seoul, we will definitely need more charging stations," Noh said, envisaging an ideal plan to establish a ring-shaped network of charging stations built around the vicinity of Seoul. 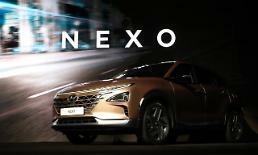 The hydrogen bus shares a lot of parts with "NEXO", Hyundai's commercial fuel cell-powered sport utility vehicle released earlier this year. Seoul city officials do not care much about operating costs, citing a technical advance, but they are more concerned about a public perception because it's hard to win over city dwellers who think hydrogen fuel charging stations are dangerous. Because of growing concerns about a dwindling supply of oil and emissions of pollutants, energy researchers are reconsidering hydrogen as a source of clean energy. Some countries have tried to adopt hydrogen fuel for their public transport system, but none has been successful. Beijing demonstrated a test run of three hydrogen buses in 2006, but commercialization has yet to come for various reasons. Vancouver, the southwestern port city of Canada, brought in a fleet of hydrogen buses into operation in 2010, but service came to a halt five years later due to lack of charging stations and high operating costs.